Verbatim DVD-RAM media in a Type 4 Cartridge offers 9.4GB of rewritable storage capacity and superior recording quality. This single-sided disc is encased in a protective (Type 4) cartridge. The disc can be removed from the cartridge for playback in DVD-ROM drives which have DVD-RAM playback capability. 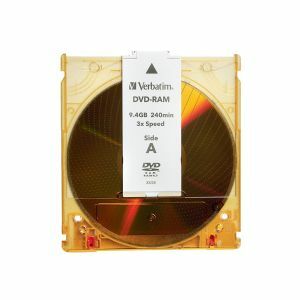 Verbatim 9.4GB DVD-RAM 3X discs are compatible with drives and video recorders from Panasonic, Toshiba, Hitachi, JVC, Samsung, LG and others. You can add to or write over data stored on a DVD-RAM more than 100,000 times. DVD-RAM cartridges and discs require recorders and DVD-ROM drives compatible with DVD-RAM media, and will not play in a standard DVD player. I've used DVD-RAMs with two different DVD-RAM compatible recorders and DVD-RAM compatible players for several years. I seldom use other than RAM disks and after and these disks have performed very well and the price was right.